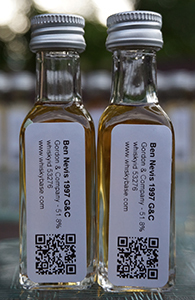 The last indie Ben Nevis I reviewed was excellent—this Archives 27 yo. It featured everything that has made Ben Nevis an unlikely hero in recent years: loads of fruit, malt and nut, and those other savoury, slightly funky notes that make Ben Nevis so unique. Of course, you don’t have to go to older Ben Nevis for these pleasures. The recent official 10 yo is also excellent (though I am not sure what its current status is). This cask from Berry Bros. & Rudd more or less splits the age difference between those two; will it be in line with those two? Or will it be closer to the 19 yo from Montgomerie’s that I reviewed in between those two and which was distilled in the same year? Let’s see. Here is the last of four Total Wine exclusives that I purchased a couple of months ago. In April, Michael K. and I posted simul-reviews of three of these: a Glen Ord, a Caol Ila, and a Laphroaig. The last is this Ben Nevis. Michael K. has a sample of this as well but we didn’t end up setting up a simul-review of this one for some reason. Like the Glen Ord and the Caol Ila, this one was also bottled by Montgomerie’s. Ben Nevis of this age, from ex-bourbon casks can be very fruity indeed and so this has potential; on the other hand, the other Montgomerie’s selections did not exactly set the world on fire. Let’s see where this one falls. I’ve reviewed this Ben Nevis before. That was a review of a purchased sample — I ended by saying I might have to purchase a bottle and I did. I opened the bottle pretty quickly after purchase and took it to one of my local group’s tastings (where it did quite well). I’ve been drinking the bottle down at a pretty steady clip since then and figured I’d re-review it to see how much overlap there is between my notes on the two occasions. You’ll have to believe me when I say that I have not re-read the first review before starting on this one. I’ve had more Ben Nevis in the last year or so than I had in all my years drinking whisky before then. But I don’t think I’ve had very many in this general age range that were from sherry casks and so I’m very interested to try this one. Ben Nevis is a pretty idiosyncratic malt at the best of times and it’s possible that sherry could saw off some of its rougher edges in either a good or bad way. In the case of this excellent 25 yo the sherry had a very nice impact but that was a case of double maturation, not full-term sherry maturation. Battlehill’s releases are exclusive to Total Wine, I think—at any rate, I’ve not seen them anywhere else. Frankly, I’m not entirely sure who Battlehill are—I have a vague recollection that it may simply be one of Duncan Taylor’s lines. If so, I suppose it may have been a replacement for their earlier value line, Whisky Galore. That one featured whiskies that were not at cask strength and I believe that may be true of all of Battlehill’s releases, not just this one; on the other hand, the Whisky Galore bottles listed distillation years and were single casks, neither of which is true of Battlehill. If this is indeed a Duncan Taylor operation I have very limited positive experience with their Ben Nevis selections: I quite liked a younger Ben Nevis bottled by Whisky Galore a decade ago. On the other hand, if they’re not in fact a Duncan Taylor line you’ve just wasted however many seconds it took you to read this. You’re welcome! As the whisky bubble continues to inflate and prices for malts from established names (and also some not very established ones) rise higher and higher, we are going to see the independents bring more and more single casks from previously second and third tier distilleries to market. This is not a particularly original insight/forecast—a lot of people have made it. Not a lot of people would have said some years ago, however, that Ben Nevis might be poised for an image makeover—the official malt has always been idiosyncratic. I have a theory though that its profile is going to rise. For one thing, the owners seem to be releasing more of it (and asking good money for some of it); for another, I think as more and more sherried Ben Nevis shows up it is going to win whisky geeks over. I am somewhat unusual, I gather, in having liked every Ben Nevis I’ve tried. It probably helps that I’ve tried very few. 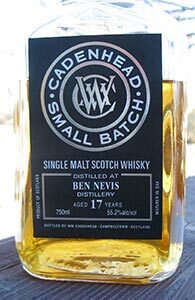 The last Cadenhead’s Small Batch I tried (Friday’s Auchentoshan 14) reversed a negative trend; I hope this Ben Nevis 17 won’t reverse a positive one. Let’s get right to it.